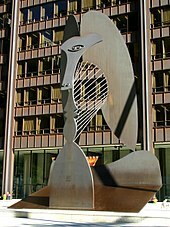 The surname "Picasso" comes from Liguria, a coastal region of north-western Italy; its capital is Genoa. There was a painter from the area named Matteo Picasso [fr] (1794-1879), born in Recco (Genoa), of late neoclassical style portraiture, though investigations have not definitively determined his kinship with the branch of ancestors related to Pablo Picasso. The direct branch from Sori, Liguria (Genoa), can be traced back to Tommaso Picasso (1728-1813). 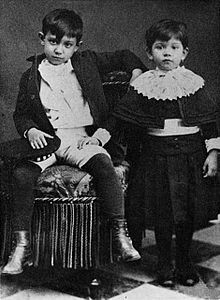 His son Giovanni Battista, married to Isabella Musante, was Pablo's great-great-grandfather. 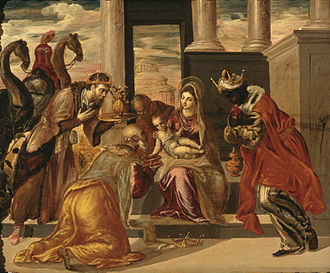 Of this marriage was born Tommaso (Sori, 1787–Málaga, 1851). Pablo's maternal great-grandfather, Tommaso Picasso moved to Spain around 1807. 1910, Portrait of Daniel-Henry Kahnweiler, The Art Institute of Chicago. Picasso wrote of Kahnweiler "What would have become of us if Kahnweiler hadn't had a business sense?" 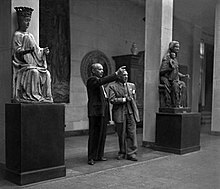 Stanisław Lorentz guides Pablo Picasso through the National Museum in Warsaw in Poland during exhibition Contemporary French Painters and Pablo Picasso's Ceramics, 1948. Picasso gave Warsaw's museum over a dozen of his ceramics, drawings and colour prints. 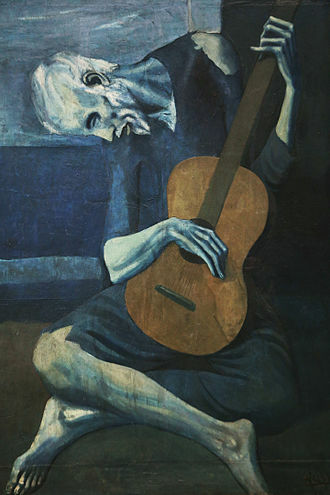 Retreating to his studio, he continued to paint, producing works such as the Still Life with Guitar (1942) and The Charnel House (1944–48).Although the Germans outlawed bronze casting in Paris, Picasso continued regardless, using bronze smuggled to him by the French Resistance. In March 2018 his Femme au Béret et à la Robe Quadrillée (1937), a portrait of Marie-Thérèse Walter, sold for £49.8m at Sotheby's in London. ^ "Picasso". Random House Webster's Unabridged Dictionary. ^ "The Guitar, MoMA". Moma.org. Retrieved 3 February 2012. ^ "Sculpture, Tate". Tate.org.uk. Retrieved 3 February 2012. ^ "Matisse Picasso – Exhibition at Tate Modern". Tate. ^ Searle, Adrian (7 May 2002). "A momentous, tremendous exhibition". Guardian. UK. Retrieved 13 February 2010. ^ "Matisse and Picasso Paul Trachtman, Smithsonian, February 2003" (PDF). ^ Hamilton, George H. (1976). "Picasso, Pablo Ruiz Y". 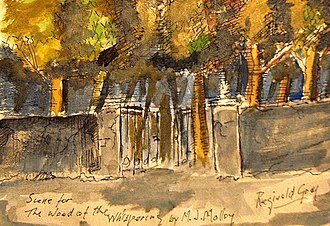 In William D. Halsey. Collier's Encyclopedia. 19. New York: Macmillan Educational Corporation. pp. 25–26. ^ Neil Cox (2010). The Picasso Book. Tate Publishing. p. 124. ISBN 978-1-85437-843-9. Unlike Matisse's chapel, the ruined Vallauris building had long since ceased to fulfill a religious function, so the atheist Picasso no doubt delighted in reinventing its use for the secular Communist cause of 'Peace'. ^ a b "Picasso: Creator and Destroyer – 88.06". Theatlantic.com. Retrieved 21 December 2009. ^ a b Wertenbaker 1967, 13. ^ Cirlot 1972, p. 6. ^ Cirlot 1972, p. 14. ^ Cirlot 1972, p. 37. ^ Cirlot 1972, pp. 87–108. ^ Cirlot 1972, p. 125. ^ Cirlot 1972, p. 127. ^ Wattenmaker, Distel, et al. 1993, p. 304. ^ The Frugal Repast, Metropolitan Museum of Art. Retrieved 11 March 2010. ^ Wattenmaker, Distel, et al. 1993, p. 194. ^ "Portrait of Gertrude Stein". Metropolitan Museum. Retrieved 26 August 2010. ^ "Special Exhibit Examines Dynamic Relationship Between the Art of Pablo Picasso and Writing" (PDF). Yale University Art Gallery (Press release). Archived from the original (PDF) on 26 May 2013. ^ James R. Mellow. Charmed Circle. Gertrude Stein and Company. ^ "Cubism and its Legacy". Tate Liverpool. Retrieved 26 August 2010. ^ Rubin 1980, p. 87. ^ "Culture Shock", pbs.org. Retrieved 7 January 2017. ^ Richard Lacayo (7 April 2009). "Art's Great Whodunit: The Mona Lisa Theft of 1911". TIME. Time Inc. Retrieved 28 June 2013. ^ Harrison, Charles; Frascina, Francis; Perry, Gillian (1993). Primitivism, Cubism, Abstraction. Google Books. Retrieved 26 August 2010. ^ "Melissa McQuillan, Primitivism and Cubism, 1906–15, War Years, From Grove Art Online, MoMA". Moma.org. 1915-12-14. Retrieved 2014-07-17. ^ "Paul (Paolo) Picasso is born". Xtimeline.com. Archived from the original on 2 April 2012. Retrieved 3 February 2012. ^ Berggruen, Olivier (2018). "Stravinsky and Picasso: Elective Affinities". In Berggruen, Olivier. Picasso: Between Cubism and Neoclassicism, 1915–1925. Milan: Skira. ISBN 88-572-3693-5. ^ a b c Cowling & Mundy 1990, p. 201. ^ a b c "Melissa McQuillan, Pablo Picasso, Interactions with Surrealism, 1925–35, from Grove Art Online, 2009 Oxford University Press, MoMA". Moma.org. 1931-01-12. Retrieved 2014-07-17. ^ Richard Dorment (8 May 2012). "Picasso, The Vollard Suite, British Museum, review". The Daily Telegraph. Retrieved 19 May 2012. ^ "Guernica Introduction". Pbs.org. Retrieved 21 December 2009. ^ The Spanish Wars of Goya and Picasso, Costa Tropical News Archived 9 May 2010 at the Wayback Machine. Retrieved 4 June 2010. ^ The MoMA retrospective of 1939–40 — see Michael C. FitzGerald, Making Modernism: Picasso and the Creation of the Market for Twentieth-Century Art (New York: Farrar, Straus and Giroux, 1995; Berkeley: University of California Press, 1996), pp. 243–262. ^ Lorentz, Stanisław (2002). Sarah Wilson, ed. Paris: capital of the arts, 1900–1968. Royal Academy of Arts. p. 429. ISBN 0-900946-98-9. ^ Françoise Gilot and Carlton Lake, Life with Picasso, Random House. May 1989. ISBN 0-385-26186-1; first published in November 1964. ^ Pukas, Anna (December 1, 2010). "Picasso's true passion". Daily Express. ^ Witham, Larry, and Pablo Picasso (2013). Picasso and the Chess Player: Pablo Picasso, Marcel Duchamp and the Battle for the Soul of Modern Art. Hanover [u.a. ]: Univ. Press of New England. p. 254. ISBN 978-1-61168-253-3. ^ Filler, Martin (11 June 2009). "The Late Show". The New York Review of Books 56 (10): 28–29. ^ Martin Filler says "the new constituency for late Picasso had much to do with new directions in avant-garde painting since his death, which made many people look quite differently at this startling final output." "The Late Show". The New York Review of Books 56 (10): 28–29. ^ Kimmelman, Michael (28 April 1996). "Picasso's Family Album,". New York Times. Retrieved 26 August 2010. ^ a b c Richardson, John (25 November 2010). "How Political Was Picasso?". The New York Review of Books, pp. 27–30. ^ a b "Picasso's commitment to the cause". Treasures of the World. PBS. 1999. ^ National Gallery of Victoria (2006). "An Introduction to Guernica". Retrieved 2 April 2013. ^ Eakin, Hugh (November 2000). "Picasso's Party Line". ARTnews. Vol. 99 no. 10. Archived from the original on 25 July 2011. ^ Ashton, Dore and Pablo Picasso (1988). Picasso on Art: A Selection of Views. Da Capo Press. p. 140. ISBN 0-306-80330-5. ^ "Pablo Picasso desairó a Salvador Dalí" [Failed attempts at correspondence between Dalí and Picasso] (in Spanish). La República. 14 April 2006. Retrieved 14 February 2017. ^ "Study on Salvador Dalí". Monografias.com. 7 May 2007. Retrieved 26 August 2010. ^ "Article on Dalí in 'El Mundo',". Elmundo.es. Retrieved 26 August 2010. ^ Huffington, Arianna S. (1988). Picasso: Creator and Destroyer. Simon and Schuster. p. 390. ISBN 978-0-7861-0642-4. ^ Keen, Kirsten Hoving. 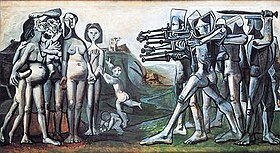 "Picasso's Communist Interlude: The Murals of War and Peace". The Burlington Magazine, Vol. 122, No. 928, Special Issue Devoted to Twentieth Century Art, July, 1980. p. 464. ^ "Pablo Ruiz Picasso (1881–1973) | Picasso gets Stalin Peace Prize | Event view". Xtimeline.com. Archived from the original on 19 March 2012. Retrieved 3 February 2012. ^ Berger, John (1965). The Success and Failure of Picasso. Penguin Books, Ltd. p. 175. ISBN 978-0-679-73725-4. ^ Charlotte Higgins (28 May 2010). "Picasso nearly risked his reputation for Franco exhibition". The Guardian. UK: Guardian News and Media. ^ Moskowitz, Clara (8 February 2013). "Picasso's Genius Revealed: He Used Common House Paint", Live Science. Retrieved 9 February 2013. ^ Rubin 1980, pp. 150–151. ^ Cirlot 1972, p. 164. ^ a b Cowling & Mundy 1990, p. 208. ^ Cirlot 1972, pp. 158–159. ^ a b c Danto, Arthur (August 26/September 2, 1996). "Picasso and the Portrait". The Nation 263 (6): 31–35. ^ Life 4 March 1940 "Picasso: Spanish Painter's Big Show Tours the Nation". Retrieved 12 January 2017. ^ Hughes, Robert (8 June 1998). "The Artist Pablo Picasso". Time. Retrieved 12 January 2017. ^ "Picasso: Masterpieces from the Musée National Picasso, Paris". deYoung Museum. Retrieved 24 July 2011. ^ "Art Gallery of New South Wales". Artgallery.nsw.gov.au. Retrieved 2014-07-17. ^ Artprice and AMMA. "The Art Market in 2015" (PDF). Retrieved 14 February 2017. ^ S. Goodenough, 1500 Fascinating Facts, Treasure Press, London, 1987, p 241. ^ "Art Loss Register Lists Most Stolen Artists". ArtLyst. 28 January 2012. ^ "Frequently Requested Member Artists". Artists Rights Society. March 2015. Retrieved 14 February 2017. ^ "Picasso portrait sells for $95.2 million, Today, Associated Press". Retrieved 5 May 2006. ^ Vogel, Carol (9 March 2010). 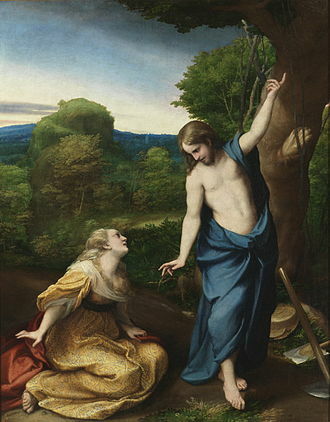 "Christie's Wins Bid to Auction $150 Million Brody Collection". Nytimes.com. Retrieved 3 February 2012. ^ Adam Justice. "Picasso painting smashes art auction record in $179.4m sale". International Business Times UK. ^ "Early Picasso work sells for record $63.4M". 20 June 2016. ^ "Picasso Work Stolen By Nazis Sells for $45 Million at Auction", The Jerusalem Post, May 17, 2017. .
^ Neate, Rupert (1 March 2018). "13 Picasso works bought for £113m by one London buyer". the Guardian. Retrieved 3 March 2018. ^ "Zervos Catalogue raisonné Pablo Picasso, une source". 17 June 2014. Becht-Jördens, Gereon; Wehmeier, Peter M. (2003). Picasso und die christliche Ikonographie: Mutterbeziehung und künstlerische Position. Berlin: Dietrich Reimer Verlag. ISBN 978-3-496-01272-6. Berger, John (1989). The Success and Failure of Picasso. Pantheon Books. ISBN 978-0-679-72272-4. Cirlot, Juan Eduardo (1972). Picasso, Birth of a Genius. New York and Washington: Praeger. Cowling, Elizabeth; Mundy, Jennifer (1990). On Classic Ground: Picasso, Léger, de Chirico and the New Classicism, 1910–1930. London: Tate Gallery. ISBN 978-1-85437-043-3. Daix, Pierre (1994). Picasso: Life and Art. Icon Editions. ISBN 978-0-06-430201-2. FitzGerald, Michael C. (1996). Making Modernism: Picasso and the Creation of the Market for Twentieth-century Art. Berkeley: University of California Press. ISBN 978-0-520-20653-3. Granell, Eugenio Fernández (1981). Picasso's Guernica: The End of a Spanish Era. Ann Arbor, Mich.: UMI Research Press. ISBN 978-0-8357-1206-4. Krauss, Rosalind E. (1999). The Picasso Papers. MIT Press. ISBN 978-0-262-61142-8. Mallén, Enrique (2003). The Visual Grammar of Pablo Picasso. New York: Peter Lang. ISBN 978-0-8204-5692-8. 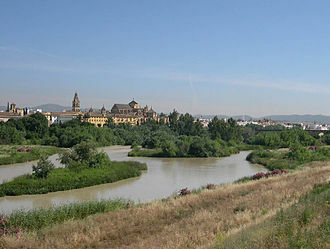 Mallén, Enrique (2005). La sintaxis de la carne: Pablo Picasso y Marie-Thérèse Walter. Santiago de Chile: Red Internacional del Libro. ISBN 978-956-284-455-0. Mallén, Enrique (2009). A Concordance of Pablo Picasso's Spanish Writings. New York: Edwin Mellen Press. ISBN 978-0-7734-4713-4. Mallén, Enrique (2010). A Concordance of Pablo Picasso's French Writings. New York: Edwin Mellen Press. ISBN 978-0-7734-1325-2. Retrieved 8 October 2010. Picasso, Olivier Widmaier (2004). Picasso: The Real Family Story. Prestel. ISBN 978-3-7913-3149-2. Rubin, William (1981). Pablo Picasso: A Retrospective. Little Brown & Co. ISBN 978-0-316-70703-9. Wattenmaker, Richard J. (1993). Great French Paintings from the Barnes Foundation: Impressionist, Post-impressionist, and Early Modern. New York: Alfred A. Knopf. ISBN 978-0-679-40963-2. Wertenbaker, Lael Tucker (1967). The World of Picasso (1881– ). Time-Life Books. 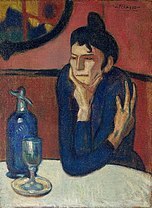 Wikimedia Commons has media related to Pablo Picasso. Scenic design is the creation of theatrical, as well as film or television scenery. Scenic designers come from a variety of backgrounds, but in recent years, are mostly trained professionals. Scenic designers design sets and scenery that aim to fully immerse the viewer in the production, a designer looks at the details searching for evidence through research to produce conceptual ideas that’s best toward supporting the content and values with visual elements. The subject of, “How do we generate creative ideas. ”The most consuming part of expanding our horizons toward scenic concepts is more than witnessing creativity. It starts with us opening our mind to the possibilities, to have an attitude toward learning and engaging in creativity and to be willing to be adventurous and curious. Whether outside or inside, colorful trees or concerts, star lit skies or the architecture of a great building, discovering what will best clarify and support the story being told. The scenic designer works with the director and other designers to establish a visual concept for the production. After almost a whole century of political instability and many civil wars, the aim of the Restoration was to create a new political system, which ensured stability by the practice of turnismo. 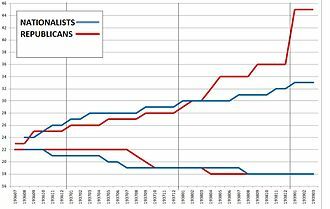 This was the rotation of the Liberal and Conservative parties in the government, so no sector of the bourgeoisie felt isolated. This was achieved by electoral fraud, opposition to the system came from republicans, anarchists and Catalan nationalists, and Carlists. The pronunciamiento by Martinez Campos established Alfonso XII as king, marking the end of the First Spanish Republic, after this, the Constitution of 1876 was written and enforced during the whole restoration. This constitution established Spain as a monarchy with a bicameral legislature, consisting of an upper house. 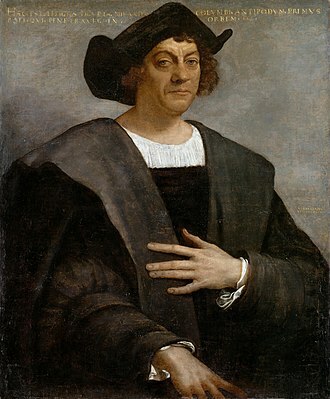 This constitution gave the King the power to name Senators and to revoke laws if he wanted to and these years were marked by economic prosperity. Spains economy had fallen behind those of the other European countries, on most fronts production was increased, supported by extreme protectionist measures. The two parties alternated in the government in a process known as el turno pacífico, the Liberal Party was led by Sagasta. In 1898, Spain lost its last major overseas colonies in the Spanish–American War and this was the start of the systems decline, giving energy to all manner of conflicting opposition movements at a local and national level. The government declared a state of war and sent the army to crush the revolt, causing over a hundred deaths, the problems in Morocco worsened as an army of natives attacked the Spanish army. 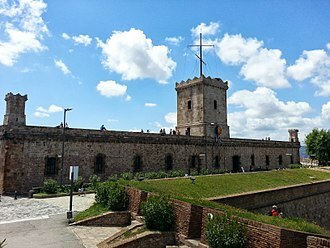 They achieved surprise and, due to the skill of the Moroccan chieftain, Abd-Al-Krim, virtually annihilated the Spanish army, advancing almost as far as Melilla in the Battle of Annual. The military discontent, the fear of anarchist terrorism or a revolution, and the rise of nationalist movements ultimately caused great agitation amongst the civilians. On 13 September 1923, Miguel Primo de Rivera, Captain General of Catalonia, orchestrated a coup détat, Alfonso XIII backed the General and named him Prime Minister. Printmaking is the process of making artworks by printing, normally on paper. Printmaking normally covers only the process of creating prints that have an element of originality, except in the case of monotyping, the process is capable of producing multiples of the same piece, which is called a print. Each print produced is not considered a copy but rather is considered an original, a print may be known as an impression. Printmaking is not chosen only for its ability to multiple impressions. Prints are created by transferring ink from a matrix or through a screen to a sheet of paper or other material. Screens made of silk or synthetic fabrics are used for the screenprinting process, other types of matrix substrates and related processes are discussed below. Multiple impressions printed from the matrix form an edition. Prints may be printed in book form, such as illustrated books or artists books, Printmaking techniques are generally divided into the following basic categories, where ink is applied to the original surface of the matrix. Relief techniques include woodcut or woodblock as the Asian forms are known, wood engraving. Intaglio, where ink is applied beneath the surface of the matrix. Intaglio techniques include engraving, mezzotint, planographic, where the matrix retains its original surface, but is specially prepared and/or inked to allow for the transfer of the image. Planographic techniques include lithography and digital techniques, where ink or paint is pressed through a prepared screen, including screenprinting and pochoir. Other types of printmaking techniques outside these groups include collagraphy and viscosity printing, collagraphy is a printmaking technique in which textured material is adhered to the printing matrix. This texture is transferred to the paper during the printing process, Contemporary printmaking may include digital printing, photographic mediums, or a combination of digital and traditional processes. Many of these techniques can be combined, especially within the same family, for example, Rembrandts prints are usually referred to as etchings for convenience, but very often include work in engraving and drypoint as well, and sometimes have no etching at all. Assemblage is an artistic form or medium usually created on a defined substrate that consists of three-dimensional elements projecting out of or from the substrate. It is similar to collage, a two-dimensional medium and it is part of the visual arts, and it typically uses found objects, but is not limited to these materials. The origin of the art form dates to the cubist constructions of Pablo Picasso c, the origin of the word can be traced back to the early 1950s, when Jean Dubuffet created a series of collages of butterfly wings, which he titled assemblages dempreintes. 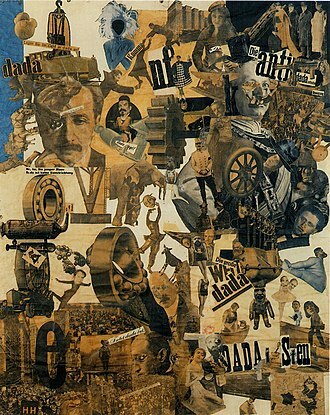 However, both Marcel Duchamp, Pablo Picasso and others had been working with found objects for many years prior to Dubuffet, Russian artist Vladimir Tatlin created his counter-reliefs in the mid 1910s. 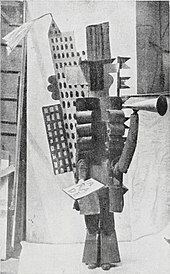 Alongside Tatlin, the earliest woman artist to try her hand at assemblage was Elsa von Freytag-Loringhoven, in Paris in the 1920s Alexander Calder, Jose De Creeft and others began making fully 3-dimensional works from metal scraps, found metal objects and wire. In the U. S. one of the earliest and most prolific assemblage artists was Louise Nevelson, in 1961, the exhibition The Art of Assemblage was featured at the New York Museum of Modern Art. William C Seitz, the curator of the exhibition, described assemblages as being made up of preformed natural or manufactured materials, arman, French artist and painter. Hans Bellmer, a German artist known for his life-sized female dolls, wallace Berman, an American artist known for his verifax collages. André Breton, a French artist, regarded as a founder of Surrealism. John Chamberlain, a Chicago artist known for his sculptures of welded pieces of wrecked automobiles, greg Colson, an American artist known for his wall sculptures of stick maps, constructed paintings, solar systems and intersections. Many of his boxes, such as the famous Medici Slot Machine boxes, are interactive and are meant to be handled, rosalie Gascoigne, a New Zealand-born Australian sculptor. Raoul Hausmann, an Austrian artist and writer and a key figure in Berlin Dada, his most famous work is the assemblage Der Geist Unserer Zeit - Mechanischer Kopf, Robert H.
Olga Picasso, born Olga Stepanovna Khokhlova was a Russian ballet dancer, but better known as the first wife of Pablo Picasso and the mother of his son, Paulo. Olga Khokhlova was born in Nezhin, Government of Chernigov, Russian Empire, Olga wanted to be a ballerina from the time she visited France and saw Madame Shroessont perform. She became a member of the Ballets Russes of Sergei Diaghilev, on May 18,1917, Olga danced in Parade – a ballet by Sergei Diaghilev, Erik Satie and Jean Cocteau – on its opening night at the Théâtre du Châtelet. 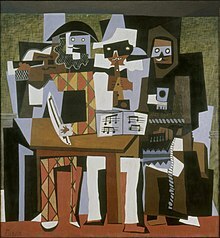 Pablo Picasso had designed the costumes and set for the ballet, after meeting Picasso, Olga left the group, which toured South America, and stayed in Barcelona with him. 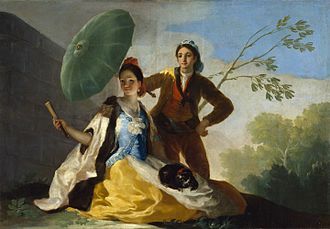 He introduced her to his family, at first his mother was alarmed by the idea that her son should marry a foreigner, so he gave her a painting of Olga as a Spanish girl. 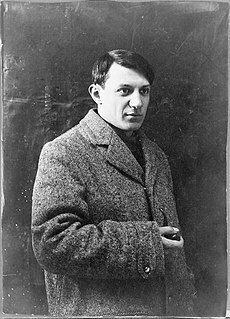 Later Olga returned with Picasso to Paris, where began to live together on the Rue La Boétie. Olga married Picasso on July 12,1918, at the Russian Orthodox Cathedral at the Rue Daru, Jean Cocteau and Max Jacob were witnesses to the marriage. In July 1919, Pablo and Olga went to London for the performance of Le Tricorne, for which Picasso again had designed costumes, the ballet was performed at the Alhambra in Spain, and was a great success at the Paris Opera in 1919. On February 4,1921, Olga gave birth to a boy named Paulo, from on, Olga and Picassos relationship deteriorated. In 1927, Picasso began an affair with a seventeen-year-old French girl, in 1935, Olga learned of the affair from a friend, who informed her that Walter was pregnant. Immediately, Olga took Paulo, moved to the South of France, Picasso refused to divide his property evenly with her as required by French law, so Olga stayed legally married to him until her death from cancer in Cannes, France in 1955. Paulo, who died on June 5,1975, was married to Emilienne Lotte and they had two children and Marina. 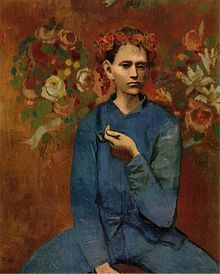 In 1990, Marina Picasso founded an orphanage in Thu Duc, named The Village of Youth, it was funded by Marina’s inheritance from her grandfather, Pablo Picasso. Marina’s foundation has organized the digging of wells in inland Vietnam, sends regular shipments of milk to orphanages and hospitals. Guernica is a mural-sized oil painting on canvas by Spanish artist Pablo Picasso completed in June 1937. The painting, which uses a palette of gray, standing at 3.49 meters tall and 7.76 meters wide, the large mural shows the suffering of people wrenched by violence and chaos. 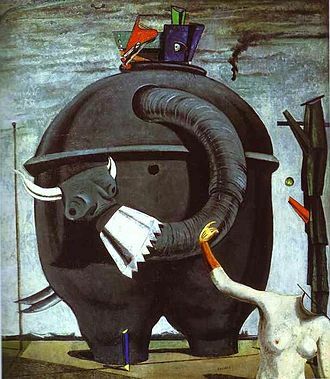 Prominent in the composition are a horse, a bull. The painting was created in response to the bombing of Guernica, the touring exhibition was used to raise funds for Spanish war relief. The painting became famous and widely acclaimed, and it helped bring attention to the Spanish Civil War. 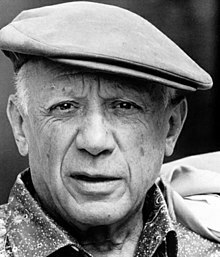 At the time, Picasso was living in Paris, where he had been named Honorary Director-in-Exile of the Prado Museum and he had last visited Spain in 1934 and never returned. His initial sketches for the project, on which he worked somewhat dispassionately from January until late April, immediately upon hearing reports of the 26 April bombing of Guernica, the poet Juan Larrea visited Picasso and urged him to make the bombing his subject. 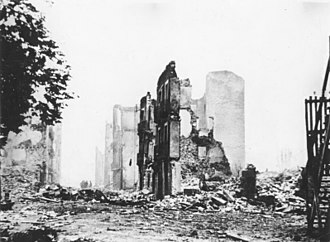 However, it was only on 1 May, having read George Steers eyewitness account of the bombing, Guernica is a town in the province of Biscay in Basque Country. During the Spanish Civil War, it was regarded as the bastion of the Republican resistance movement. The Republican forces were made up of assorted factions with differing goals, the Nationalists, led by General Francisco Franco, sought a return to pre-Republican Spain, based on law and traditional Catholic values. At about 16,30 on Monday,26 April 1937, warplanes of the German Condor Legion, commanded by Colonel Wolfram von Richthofen, germany, at this time led by Hitler, had lent material support to the Nationalists. Later, intense aerial bombardment became a preliminary step in the Blitzkrieg tactic. The 250s toppled a number of houses and destroyed the water mains, the incendiaries now could spread and become effective. The materials of the houses, tile roofs, wooden porches, most inhabitants were away because of a holiday, a majority of the rest left town immediately at the beginning. Henri-Émile-Benoît Matisse was a French artist, known for both his use of colour and his fluid and original draughtsmanship. He was a draughtsman and sculptor, but is primarily as a painter. Although he was labelled a Fauve, by the 1920s he was increasingly hailed as an upholder of the classical tradition in French painting. His mastery of the language of colour and drawing, displayed in a body of work spanning over a half-century. Matisse was born in Le Cateau-Cambrésis, in the Nord department in northern France and he grew up in Bohain-en-Vermandois, France. In 1887 he went to Paris to study law, working as an administrator in Le Cateau-Cambrésis after gaining his qualification. He first started to paint in 1889, after his mother brought him art supplies during a period of following an attack of appendicitis. He discovered a kind of paradise as he described it. In 1891 he returned to Paris to study art at the Académie Julian and became a student of William-Adolphe Bouguereau, initially he painted still lifes and landscapes in a traditional style, at which he achieved reasonable proficiency. Chardin was one of the painters Matisse most admired, as an art student he made copies of four of Chardins paintings in the Louvre, in 1896 and 1897, Matisse visited the Australian painter John Peter Russell on the island Belle Île off the coast of Brittany. Russell introduced him to Impressionism and to the work of van Gogh and he said Russell was my teacher, and Russell explained colour theory to me. In 1896 Matisse exhibited five paintings in the salon of the Société Nationale des Beaux-Arts, with the model Caroline Joblau, he had a daughter, born in 1894. In 1898 he married Amélie Noellie Parayre, the two raised Marguerite together and had two sons and Pierre, Marguerite and Amélie often served as models for Matisse. In 1898, on the advice of Camille Pissarro, he went to London to study the paintings of J. M. W. Turner and went on a trip to Corsica. Upon his return to Paris in February 1899, he worked beside Albert Marquet and met André Derain, Jean Puy, Matisse immersed himself in the work of others and went into debt from buying work from painters he admired. Crystal Cubism is a distilled form of Cubism consistent with a shift, between 1915 and 1916, towards a strong emphasis on flat surface activity and large overlapping geometric planes. The primacy of the geometric structure, rooted in the abstract. The tightening of the compositions, the clarity and sense of reflected in these works, led to its being referred to by the French poet. 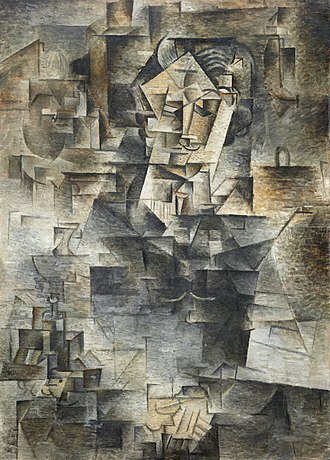 The collective phenomenon of Cubism once again—now in its advanced revisionist form—became part of a widely discussed development in French culture, in terms of the separation of culture and life, the Crystal Cubist period emerges as the most important in the history of Modernism. Cubism, from its inception, stems from the dissatisfaction with the idea of form that had been in practiced since the Renaissance, Cézanne was preoccupied by the means of rendering volume and space, surface variations with overlapped shifting planes. Increasingly in his works, Cézanne achieves a greater freedom. His work became bolder, more arbitrary, more dynamic and increasingly nonrepresentational, as his color planes acquired greater formal independence, defined objects and structures began to lose their identity. Where before, the pillars of academicism had been shaken. 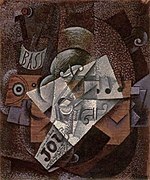 It was a regeneration, writes Gleizes, indicating the emergence of a wholly new cast of mind. Every season it appeared renewed, growing like a living body, the Cubist method leading to 1912 has been considered analytical, entailing the decomposition of the subject matter, while subsequently synthetic, built on geometric construction. 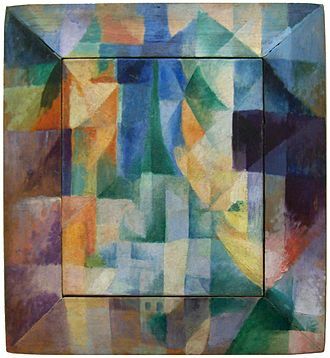 The terms Analytic Cubism and Synthetic Cubism originated through this distinction, by 1913 Cubism had transformed itself considerably in the range of spatial effects. 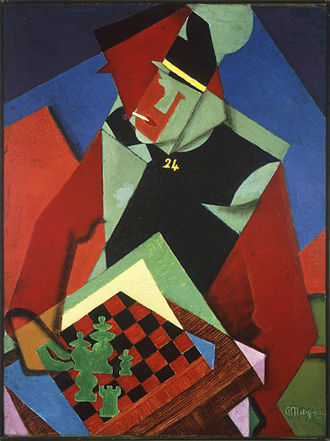 At the 1913 Salon dAutomne, a salon in which the tendency was Cubism, Metzinger exhibited En Canot, Gleizes Les Bâteaux de Pêche. In these works, more so than before, can be seen the importance of the plane in the overall composition. At the outset of the First World War many artists were mobilized, Gleizes, Braque, Léger, de La Fresnaye, despite the brutal interruption, each found the time to continue making art, sustaining differing types of Cubism. 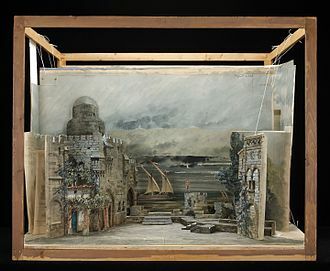 Set design model by Marcel Jambon for an 1895 Paris production of Giuseppe Verdi's Otello. Scenic designer Robert Edmond Jones (1887-1954) drawing at a waist high table (c. 1920). Henri Matisse, Le bonheur de vivre (1905–06), oil on canvas, 175 × 241 cm. 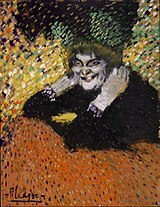 Barnes Foundation, Merion, PA. A painting that was called Fauvist and brought Matisse both public derision and notoriety. Hilton Kramer wrote: "owing to its long sequestration in the collection of the Barnes Foundation, which never permitted its reproduction in color, it is the least familiar of modern masterpieces. Yet this painting was Matisse's own response to the hostility his work had met with in the Salon d'Automne of 1905." 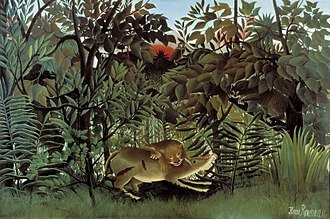 Henri Rousseau, The Hungry Lion Throws Itself on the Antelope, 1905, was the reason for the term Fauvism, and the original "Wild Beast"
El Greco, c. 1595-1600, View of Toledo, oil on canvas, 47.75 x 42.75 cm, Metropolitan Museum of Art, New York. This work has a striking resemblance to 20th-century Expressionism. 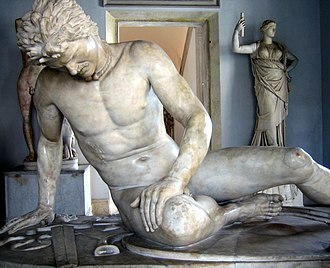 Historically however it is an example of Mannerism. 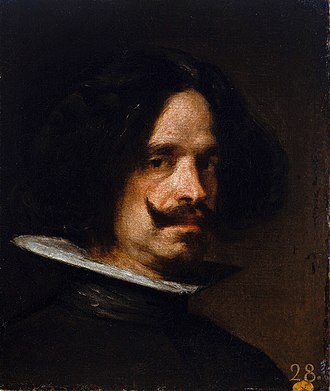 Probable self-portrait of Francisco Zurbarán as Saint Luke, c. 1635–1640. 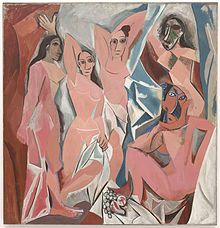 Les Demoiselles d'Avignon. 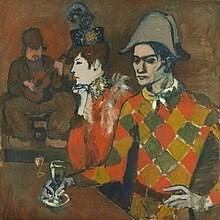 The two figures on the right are the beginnings of Picasso's African period. 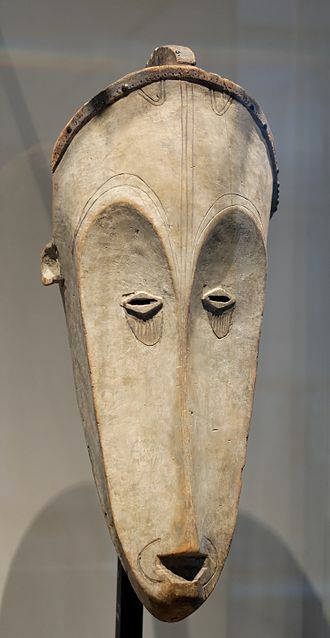 This 19th-century Fang mask is similar in style to what Picasso encountered in Paris just prior to Les Demoiselles d'Avignon. 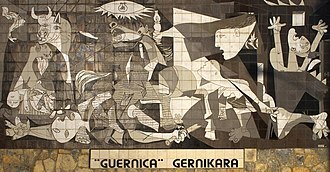 A tiled wall in Gernika claims "Guernica" Gernikara, "The Guernica (painting) to Gernika."